“My father is very strict… My brother is just wearing a turban to make my father happy…Due to the strictness in my family my siblings do not tell and inform anything about their life to my parents,” says one 39-old female Sikh respondent. She is one of respondents quoted in a research paper entitled Social Issues and Identity Threat of the Sikh Minority Community in Malaysia written by a group of Malaysian scholars led by Associate Prof Dr Sarjit Singh. The paper was published in the Asian Culture and History (Vol. 7, No. 2; 2015) poublished by Canadian Center of Science and Education. This was part of a research funded by the Government via Coalition of Malaysian Sikh Organisations (CMSO). The findings were deliberated at a half-day forum in Petaling Jaya on 27 Sept 2015. This paper attempts to present the social issues and fading identity problem faced by the Sikh community in Malaysia. Past studies show that there are no significant researches done specifically to identify the negative elements of the community issues. Several studies done mainly focussing the Sikh identity and language issues without relating to the social problems faced by the minority community. Through a Focus Group Discussion (FGD) three main issues were identified. The issues of language fading, identity threat and mixed marriages are found to be the major problems faced by the Sikh community in Malaysia. Thus, the findings of this study hoped to unveil the real problems of the minority community and would be addressed by the Sikh religious institutions and organizations. The Sikh organizations must also engage with the government agencies as equal partners to eradicate the social problems. The outcome shows that the Punjabi language is on the threat as dominated by other major languages namely English and Malay. The studies of Sikh community (Sarjit, 1999, 2005; Sarjit & Charanjit, 2008) are new, especially in the fields of anthropology and sociology in Malaysia. Writings about Sikh issues not much prioritized by the Sikhs in Malaysia. This is because the religious aspect is regarded as individual rights and personal nature that felt inappropriate or sensitive to be discussed. The scenario created a clearer gap for the researchers to explore this issue. Sikhs in Malaysia also lack information and exposure to those Sikh studies. There are several studies of Sikh issues in Canada that are significant to the literature. A study of Buchignani and Indra (1989) explored the migration issues of the Sikh community in Canada. According to Sandhu (1970), no separate worthwhile records relating to Sikh immigration were kept either in India or in Malaya. Hence, a dire lack of discussion occurs on the Sikh minorities in Malaysia. It sorely begs for more work when compared to researches in India (especially Punjab), United States, Canada and Britain. Sikh devotees salute with Waheguru Ji Ka Khalsa uttered, Waheguru Ji Ki Fateh (meaning the Khalsa is of God, the victory is to God) while bridging both hands to the chest when they met with other Sikh devotees. Typically, Sikh devotees visit Gurdwara on Sundays for religious pilgrims (congregational worship). But, this does not mean other days are not important because Sikh devotees pray every day. In the Sikh religion, all days are equally important and there is no day more special. The Gurdwara, rituals that take place every day is the morning prayer (Japji Sahib), the evening prayer (Rehraas), and to close the night (Kirtan Sohila). Before entering the Gurdwara, Sikh devotees have to clean their hands and feet and cover their head if the individual does not wear a turban. After that, the Sikh devotees have to go to Darbar Sahib for metha tekhna (bow) by placing the forehead on the floor facing the Sri Guru Granth Sahib Ji. The act is a tribute to the greatness and glory of Sri Guru Granth Sahib Ji as the living Guru. After prostrating, Sikh women will sit on the floor on the left and Sikh men will be seated on the right. They sit politely facing the Sri Guru Granth Sahib Ji and attention to religious rites conducted by the Granthi Sahib (Sarjit, 2001b: 46). The verses contained in Sri Guru Granth Sahib Ji are known as Gurbani, God’s word. In short, the children are inspired and directions to Sikh devotees, spiritual discipline comfort in mind and spirits (Cole, 2003: 7). In the Sikh religion, the congregational prayer is very important because the emphasis on equality between people regardless of gender, and is a basic (fundamental). Sikh teachers emphasize sadh sanggat to enhance the spirit of spirituality and unity among Sikhs. Sikh religious ceremonies involved the reading of verses contained in Sri Guru Granth Sahib Ji. In short, collective worship is a religious obligation as important as performing Kirtan (singing of hymns), that singing religious songs, listening to katha (lecture), utter Simran (meditation) and read Ardas (prayer). This does not mean, individual prayer (private devotion) every day is not as important as making Simran. This emphasizes the practice of meditation to praise the greatness of Waheguru (God) humanity in order to obtain peace, guidance, guide and offer thanks to God. During the Granthi Sahib (religious specialist) religious messages, it’s very gratifying to devote their full attention (Sarjit, 1999). It should be noted here that all religious ceremonies concluded with the reading of Ardas where required to stand by bridging both hands, aimed gratitude, apology, thank you, or ask any intention of Waheguru. After praying, Granthi Sahib will read Hukumnama or Vaak (Waheguru message) while opening the Sri Guru Granth Sahib Ji and read the verse quoted on the page that opens. After that, Karah Parshad (pudding) given to disciples (Sarjit, 2001). There are several studies done specifically on the Sikh community and their socio-cultural and socio-economic issues. One of the major studies, done by Serjit Sahib Singh in 1992 reveals that the community is facing uphill task to retain their culture identity surrounded by other bigger and dominant communities. The scholar also argued the upcoming generation is weak and vulnerable in terms of culture and religion. Someeta Kaur Sidhu (1996) also agreed that the community is not strong as a unit. The Sikh people also could not cope with the rapid socio-economic development of the country and feel that the religious teachings are not practical. The fading of cultural and religious belief and practise can lead the younger generation to many social ills. According to Sikh Rehat Maryada (Sikh code of conduct), a Sikh is not allowed to consume alcohol. Through personal communication technique version 6 APA referencing system, opinions gathered to justify the current issues of the community. Rajjuddin and Jesbains (2010) argued that although there are numerous well known Sikh entrepreneurs and professionals such as Gulati’s Silk Store, Euro Moda, Libaas Enterprise and Globe Silk Store, the community is still not perfect and not many members of the community are successful nowadays. The scholars also found that the youths of the community are also not interested in their parents business or professional jobs. This shows that the youths are not so worried about the economic status and are comfortable with their family assistance. They enjoy freedom to choose their life path and career. According to another key informant, the community is not living a happy lifestyle as seen by the outsiders. Thus this has created a gap to study what is the current socio-economic status of the Sikh community in Malaysia. The statement shows that alcohol is nothing new to the community. Gurcharan Singh (2013) also stated that alcoholism is a serious threat for the community that causes many families lost their fathers, brothers and husbands. The scholar also mentioned that alcoholism leads to many conflicts and fights especially after a wedding event or sports event. This unhealthy behaviour has created many negative implication on the community. This scenario could result into unhealthy activities as gangsterism, crime, theft and robbery which reveals Indians involvement in Klang Valley, Penang and Kuala Lumpur. As a result the inequality income plays a dominant role in eradicating Indian ethnic to live in urbanisation development. Apparently due to low income of job, they find insufficient of capital to spend mainly for food, rent, transport and other necessary expenses. This situation arises from poor budgeting and unnecessary expenditure on alcohol and luxury goods (Jeyakumar, 2008). Today the rising cost of urban living make them to find new job opportunities or getting into unhealthy lifestyle (Sandhu, 1970). According to the Alag Shabad Yug Trust Ludhiana (2010) there are several socio cultural issues of the Sikh community; apostasy, drug addiction, identity crisis and marriage issues. Apart from that, the free lifestyle, drug, alcohol and crime is increasing rapidly among the minority Sikh community in Canada (The Times of India, 2015). Sarjit and Charanjit (2008) argued that the Gurdwara politics as one of the crucial factors that can influence the development of the community. The scholars also stressed that manipulation of power and authority by the Gurdwara committee members can suppress the advancement of the community. Thus the main socio-cultural problems of the Sikh community in Malaysia is still unknown. It can be concluded that there is no scientific research to identify the socio cultural issues and socio-economic status of Sikh community in Malaysia. This study is inductive in nature and employed a qualitative approach. A Focus Group Discussion (FGD) was conducted to gather key respondents’ points on the social issues of Sikh’s in Malaysia. The key respondents were selected based on their knowledge and expertise on the Sikh community. The discussion is transcribed and analyzed. In this case, the participants that were selected are the community experts and scholars who have great understanding of the Sikh history, identity and contemporary issues. However, they can be selected from both academic and practical areas. The reason of meticulous selection of the key informants is to gather important themes of socio-economic status and socio-cultural issues of the community. There are few issues raised by the respondents of the minority community. The issues are mainly related to the language, identity crisis and mixed marriages. According to the respondents, the Punjabi language is slowly fading dominated by other dominant languages in Malaysia such as Malay and English. Another respondent from Sarawak also agreed that the language of the community is on threat. According to him, it is very soon that the Punjabi language will be forgotten. The conversations show that the issue of language fading is serious. The language of the minority Sikh community should be preserved and practised with no curiosity and shyness especially by the youths. The respondents are also generally agreed that the Sikh identity is on threat. Many youths in the country are not wearing Turbans which is one of the main identity of the community worldwide. The statement above clearly shows that the youths are not genuinely happy with the identity that they have to carry in the modern world. Thus, a good strategy to approach the youths to understand the Sikh identity holistically must be taken by various stakeholders namely Gurdwara as a religious institution. According to some of the respondents, mixed marriages will not lead to a successful life of the family. The couple with different religious beliefs and understandings could not keep their family relationship together. This experience was also supported by another respondent saying that the mixed marriages will lead to confusion of for the children of the couple. However, another respondent argued that mixed marriage is not a threat to Sikh people. However, generally all the respondents agreed that the community is not happy with mixed marriages as it can lead to many issues such as apostasy and divorce. Thus, it can be said that mixed marriages are still seen as a negative happening by the Sikh community. The family that went through mixed marriages will be also isolated by some members of the community. The mixed marriages issue is quite rampant and to some extent some Gurdwaras have started to compromise and accept the marriage ceremony to be conducted in the Gurdwara. The issues of the Sikh community in Malaysia are not exposed well. The community in Malaysia although small in numbers, still strongly practise their religious teachings. In this study however, it was found that the language of the community is on the threat as dominated by other major languages. The community also felt that their identity is fading and should be practised consistently especially by the youths. Mixed marriages is also found to a major issue of the community. Mixed marriages which lead to religious confusion is believed can affect the next generation of the family institution. This research is funded by Coalition of Malaysian Sikh Organisations. Buchignani, N., & Indra, D. M. (1989). Key issues in Canadian-Sikh ethnic and race relations: implications for the study of the Sikh diaspora. In N. G. Barrier, & V. Dusenbery (Eds. ), The Sikh Diaspora: Migration and Experience Beyond the Punjab (pp. 141-184). Delhi: Chanakya Publications. Cole, W. Owen. (2003). Teach Yourself Sikhism. London: Hodder Headline. Jeyakumar, D. (1993). The Indian poor in Malaysia: problems and solutions. Indian communities in Southeast Asia, 405-437. Nair, S. (2006). Poverty in the New Millennium – Challenges For Malaysia. Faculty of Economics and Administration, University of Malaya. Rajuddin, M. R., & Kaur, J. (2010). Faktor-Faktor Yang Mempengaruhi Pembangunan Kaum Sikh Dalam Bidang Keusahawanan Di Bandaraya Kuala Lumpur. Faktor-Faktor Yang Mempengaruhi Pembangunan Kaum Sikh Dalam Bidang Keusahawanan Di Bandaraya Kuala Lumpur, 1-14. Sandhu, K. S. (1970). Sikh immigration into Malaya during the period of British rule. In J. Ch’en & N. Tarling (Eds. ), Studies in the social history of China and South-East Asia (pp. 335-354). Cambridge: Cambridge University Press. Sarjit S. G. (2001). Perkahwinan campur peranakan Punjabi di Sabah. Sari 19: 189-203. Sarjit, S. G. (1999). Diaspora dan masalah identiti Sikh di Malaysia. Akademika, 55, 183-192. Sarjit, S. G. (2001). Perubahan Sosio-Budaya dan Kesannya Terhadap Identity Komuniti Sikh di Malaysia: Satu Perbincangan Kritis. Prosiding Pembentukan Identiti: Sebuah Wacana. Shamsul Amri Baharuddin (Penyusun), Hlm, 44-52. Sarjit, S. G. (2005). Peranan Gurdwara dalam pembentukan identity Sikh di Malaysia: Satu kajian perbandingan (PhD). Universiti Kebangsaan Malaysia. Sarjit, S. G., & Charanjit, K. (2008). 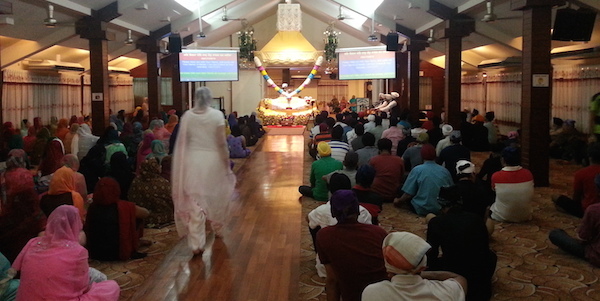 Gurdwara and its politics: Current debate on Sikh identity in Malaysia. SARI: Jurnal Alam dan Tamadun Melayu, 26, 243-255. Serjit, S. S. (1992). Krisis identiti di kalangan komuniti peranakan Punjabi yang beragama Sikh: satu kajian kes di Pantai Barat Sabah. Latihan Ilmiah. Universiti Kebangsaan Malaysia. Siwar, C., & Kasim, Y. (1997). Urban Development and Urban Poverty in Malaysia. International Journal of Social Economics, 24(12), 1524-1535. Someeta Kaur Sidhu (1996). Kebangkitan semula agama Sikh: Satu kajian kes di Kuala Lumpur. Latihan Ilmiah. Universiti Kebangsaan Malaysia. Tashakkori, A., & Teddlie, C. (Eds.). (2003). Handbook of mixed methods in social & behavioral research. Sage. It is 3 years on and what follow up actions have been taken to address the issues? Research is valuable if the results are used to move forward otherwise it collects dust. I beg to differ with some of the observations. There are a very large number of successful Sikh professionals, especially doctors and lawyers, far more than our percentage of the population. Young Sikhs are also proving themselves in other professional services such as banking, finance, and others. Intermarriage is not that common. Sikhs are still generally close knit as a community. Alcoholism is not half as bad as among the Tamils, though heavy drinking is not uncommon. First and foremost, I was surprised to be quoted, but thank that an observational study I did, in the course of my visits to Malaysia has been noted, regards the Alcohol issues around Malaysian Sikhs.This was initially written 6 years ago, the SPNnet picked it up 3 years later.An issue that has spiralled, instead of being checked, in the last few years. Briefly,the problems being faced by Sikh Malaysians have been faced by all Sikhs in the diaspora.However, for reasons unknown, the Malaysian multi ethnic composition, the state dictated policy regards religion and aggresive cgristian propogation targeting teh Sikhs,and the minority status has created some challenges unique to the Sikhs in Malaysia.The country with nearest comparison is Afghanistan.Sikhs had resided there since 1469, and over the years the Sikh population had reached 400,000- 500,000 while living within and very close knit Muslim community, until the Taliban chaos.It had thrived in the Muslim country very well.What did they do to keep their identity intact, would be an interesting question-that will relay very simple answer.Sikhi was impressed upon the family from young age.Outside exposure was minimal.Perhaps Afghan society being a very medievel helped. But their history, tells they had two powerful Khalsa Schools,where 90% of the Sikh children landed up, thus were kept very close to the religion and identity.THIS approach is now being taken up in the UK, where a number of Sikh schools have sprung up, in the last few years.It is too short a time to have any conclusive studies, but observing the performance of the Guru Nanak School in Hayes,Sikh children are increasingly attaching to their identity, with some others reaffirming their faith.To address this issues does not need scientific theories. Such schools existed in Kenya, also produced Sikhs with their identity intact.Similar Sikh schools India, produce Sikh youth in identity.The absence of such Sikh schools within the Punjab, has seen an effect similar to Malaysia, sadly. But a leaf can be taken from histories of successful Sikh communities in Panama,Abu Dhabi,or even in Myanmar-where the identity has survived successfully.